Welcome to February and the new fresh flavor of the month…Orange. I know I’m a few days late but I had a hard time deciding. In the end I went with another citrus because I enjoyed the lemons of January so much. 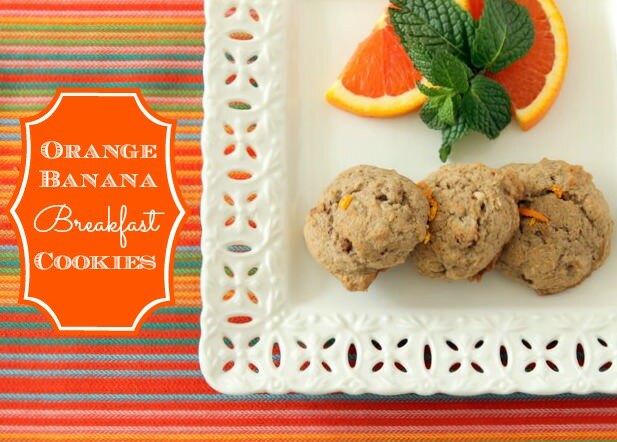 I have a variety of recipes to share including a main dish, of course some desserts and today’s recipe, Orange Banana Breakfast Cookies. 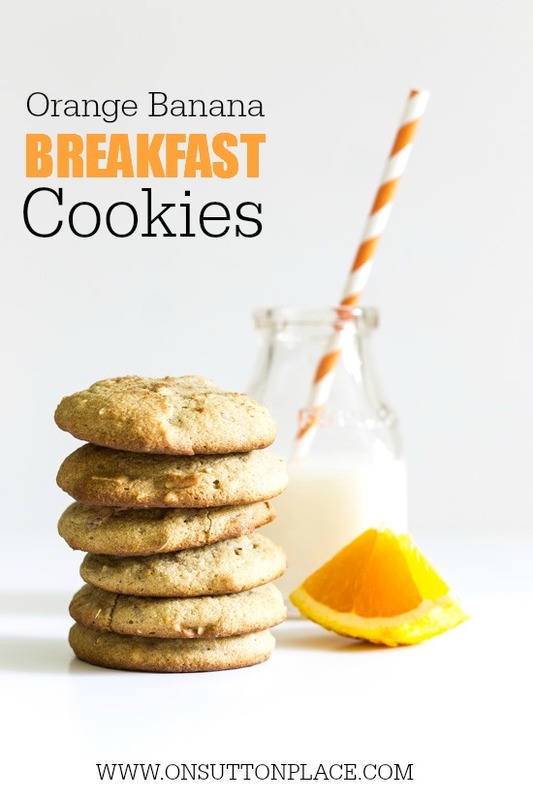 These are a healthy and hearty small cookie…so there’s no need to feel guilty if you have two! They may be little but they are packed full of nutty flavor. I used pecans because I had them in the freezer. I had toasted them before Christmas but didn’t use them all. The texture from the nuts is perfect with the fruit. The only thing I didn’t have on hand was the whole wheat flour and the orange. It’s not necessary to use two different flours if you don’t have them in your pantry. I have used different flours in this recipe and the cookies always come out great. My favorite so far is the combo of 1 cup of whole grain oat flour and 1 cup of regular flour. In a large bowl, combine the flours, salt, cinnamon and baking soda. In the bowl of a standing mixer cream together the butter and sugars until fluffy, 2-3 minutes. Add the egg, vanilla, orange zest and banana. In one batch, add the dry ingredients. Mix until just combined. Using a small cookie scoop, drop rounds of dough onto baking sheet. Bake 10 – 12 minutes until edges are lightly golden brown. The original recipe (I’m sorry but I have no idea where it came from) called for 1/4 c. old fashioned oats. If you wanted to add those just leave out 1/4 c. of one of the flours. 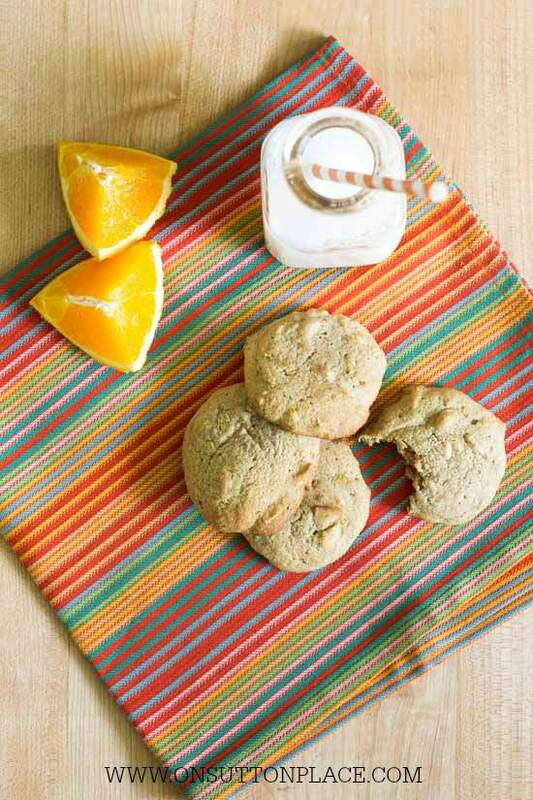 Click to see more Citrus Recipes. Love chocolate? Click to see all my Chocolate Recipes! Yum!! And how pretty does that look? gorgeous! Oh boy these look delightful Ann! I love your new blog header too btw..fun changes around here I see. Oh Ann, not only is the post gorgeous and super yummy looking! So is the new blog design! It’s stunning. Fresh, clean, so easy to navigate. Just appealing as heck and so classic. IF we have a snow day tomorrow, those are the cookies I’m making. I have all the ingredients and they look fantastic. If not snow day, then maybe I’ll make them on the weekend, but I sure hope it is tomorrow. Nothing better than baking on a snow day. Oh, my! These cookies look delicious! I send a care package to my son in the Navy every month and I think he would love some of these. Thank you for sharing the recipe, Ann! I guess Ann I am the exception, I really miss your original header, friendlier somehow. You are so talented and I like your style. Beautiful photography Ann, they sure sound good! Love your blogs new look! Ann, I love your new blog design! I have some of those Cara Cara oranges at my house and they are so delicious. The grandgirls are visiting, so I may have to make these cookies tomorrow. I’m loving your themes for each month, too. Your blog is beautiful and your photos are gorgeous! I don’t have that talent I’m afraid. These look what we like to call delooooocious! How about you just make them for me instead of me making my own? Wow…they look great…and so does your photography Ann!!!! Love your recipe layout! Mmmmm. They look great! Your photos are gorgeous!!! Your blog is beautiful, dear lady!!! I love your logo and the way it’s set up on the top is really nice, unique! Your cookies sound delis!!!! I always use all ww flour when I make cookies, so I will do that again when I make these. I’ll pin this! The photos of the cookies are stunning. And the cookies look tasty, too! Your new blog design is gorgeous! I’m making these this week… they look delicious and so healthy! I love that you chose orange for the month… I just ate an orange… they seem to be the perfect fruit for a cold February! Cookies for breakfast?? I’m so all over that! Love the new blog design, and your photos are beautiful!